My main goal for fiscal policy is shrinking the size and scope of the federal government and lowering the burden of government spending. But I’m also motivated by a desire for better tax policy, which means lower tax rates, less double taxation, and fewer corrupting loopholes and other distortions. One of the big obstacles to good tax policy is that many statists think that higher tax rates on the rich are a simple and easy way of financing bigger government. I’ve tried to explain that soak-the-rich tax policies won’t work because upper-income taxpayers have considerable ability to change the timing, level, and composition of their income. Simply stated, when the tax rate goes up, their taxable income goes down. And that means it’s not clear whether higher tax rates lead to more revenue or less revenue. This is the underlying principle of the Laffer Curve. For more information, here’s a video from Prager University, narrated by UCLA Professor of Economics Tim Groseclose. An excellent job, and I particularly like the data showing that the rich paid more to the IRS following Reagan’s tax cuts. But I do have one minor complaint. Why? Because as tax rates get closer and closer to the revenue-maximizing point, the economic damage becomes very significant. Here’s some of what I wrote about that topic back in 2012. …labor taxes could be approximately doubled before getting to the downward-sloping portion of the curve. But notice that this means that tax revenues only increase by about 10 percent. …this study implies that the government would reduce private-sector taxable income by about $20 for every $1 of new tax revenue. Does that seem like good public policy? Ask yourself what sort of politicians are willing to destroy so much private sector output to get their greedy paws on a bit more revenue. The key point to remember is that we want to be at the growth-maximizing point of the Laffer Curve, not the revenue-maximizing point. P.S. Here’s my video on the Laffer Curve. Since it was basically a do-it-yourself production, the graphics aren’t as fancy as the ones you find in the Prager University video, but I’m pleased that I emphasized on more than one occasion that it’s bad to be at the revenue-maximizing point on the Laffer Curve. Not as bad as putting rates even higher, as some envy-motivated leftists would prefer, but still an example of bad tax policy. P.P.S. 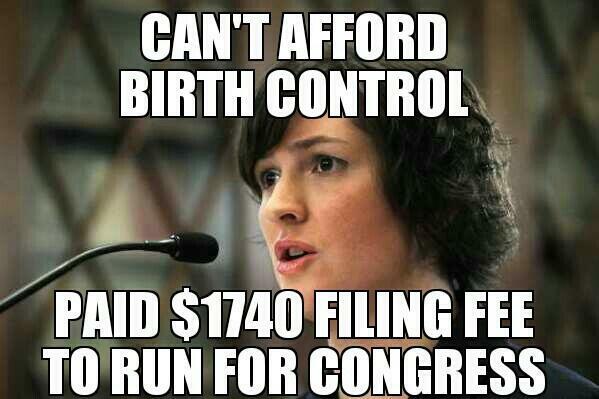 Switching to a different topic, it’s been a while since I’ve mocked Sandra Fluke, a real-life Julia. To fix this oversight, here’s an amusing image based on Ms. Fluke’s apparent interest in becoming a politician. But she’s apparently reconsidered her plans to run for Congress and instead now intends to seek a seat in the California state legislature. If you want to see previous examples of Fluke mockery, check out this great Reason video, this funny cartoon, and four more jokes here. P.P.P.S. And since I’m making one of left-wing women, we may as well include some humor about Wendy Davis. Check out this excerpt from a story in the Daily Caller. A dating service that pairs wealthy “sugar daddies” with “sugar babies” for “mutually beneficial dating arrangements” has endorsed Texas Democratic gubernatorial candidate Wendy Davis. SeekingArrangement.com’s Friday announcement followed a recent report in the Dallas Morning News which detailed a number of discrepancies in Davis’ personal narrative, including that she left a man 13 years her senior the day after he made the last payment for her Harvard Law School education. “Wendy Davis is proof that the sugar lifestyle is empowering,” seeking arrangements founder and CEO Brandon Wade said in his endorsement. Mr. Wade obviously is a clever marketer, but he may also be a closet libertarian. After all, he also mocked Obamacare with an ad telling young women to join his site so they could find a sugar daddy to pay for the higher premiums caused by government-run healthcare. Then again, I’ve also speculated that Jay Leno and Bill Maher may be closet libertarians, so I may be guilty of bending over backwards to find allies. 1. In my discussion of regulation, I mention that health and safety rules can actually cause needless deaths by undermining economic performance. I elaborated on this topic when I waded into the election-season debate about whether Obama supporters were right to accuse Romney of causing a worker’s premature death. Almost exactly one year ago, I did a post entitled “A Laffer Curve Tutorial” because I wanted readers to have all the arguments and data in one place (and also because it meant I wouldn’t have to track down all the videos when someone asked me for the full set). Today, I’m doing the same thing on the issue of government spending. If you watch these four videos, you will know more about the economics of government spending than 99.9 percent of the people in Washington. That’s not a big achievement, to be sure, since you’re being compared to a remedial class, but it’s nonetheless good to have a solid understanding of an issue. The first video defines the problem, explaining that deficits and debt are bad, but then explaining that red ink is best understood as a symptom of the real problem of too much government spending. The second video reviews the theoretical reasons why a large public sector undermines prosperity. The next video examines the empirical evidence, citing both cross-country data and academic research. Last but not least, the final video looks at the research about the growth-maximizing size of government. You may have noticed, by the way, that this post does not include any of the videos about Keynesian economics or Obama’s stimulus. That’s an entirely different issue, perhaps best described as being a debate over whether it’s good or bad in the short run to increase the burden of government spending. The videos in this post are about the appropriate size and scope of government in the long run. This post also does not include the video about fiscal restraint during the Reagan and Clinton years, or the video looking at how nations such as New Zealand and Canada were able to restrain spending. Those are case studies, not economics.